We have written elsewhere on this website about the superlative view of the Washington, DC, skyline at Top of the Town. Brides and grooms who book that wedding venue get a glorious look at the Nation’s Capital from Arlington, Virginia. We would be remiss, though, if we did not also mention the spectacular vista at 101 Constitution in downtown DC. Future spouses who want a quintessential Washington wedding experience should definitely consider that location for their nuptials. We have had the privilege of photographing several nuptials at that elegant and luxurious venue. Like any Washington, DC, wedding photographer, we eagerly await the next opportunity! Part of the appeal of a Washington, DC, wedding is the backdrop. Getting married in the Nation’s Capital means potential couples portraits in front of some of the city’s most famous landmarks. Nothing says “DC marriage celebration” quite like those photos. What sets 101 Constitution apart as a DC wedding venue is the opportunity to create those images in new and different ways. The venue is located on the top of a building just two blocks from the US Capitol. Its rooftop terrace — which is its main event facility — looks directly out over that iconic part of the Washington skyline. Brides and grooms have told us they feel like they can almost reach out and touch it! On the other side of the roof is a similarly stunning view of the Washington Monument. As DC wedding photographers, we love incorporating these elements into the pictures we take of a newly married pair. Another part of the appeal of 101 Constitution is its flexibility. Fiancés who book it for their marriage celebrations have a variety of choices regarding how to use it. They can hold both their nuptial ceremony and reception on the rooftop. Alternatively, the spouses-to-be can exchange their vows elsewhere and then have the post-ceremony party at 101 Constitution. The facility can handle as many as 400 wedding guests and is helpfully equipped with a tent. The latter keeps things warm in the winter and provides much-needed shade in the humid DC summer. The Washington-based newlyweds in this image chose to do almost everything at 101 Constitution. After getting ready at the Phoenix Park Hotel, they tied the knot and danced the night away near the US Capitol. Throughout their wedding day, this couple was committed to enjoying themselves to the fullest. They never let any lingering nerves about things going well get in the way of having fun. The bride and groom goofed around and laughed nearly the entire day. A great example of this occurred during their first look at the aforementioned swanky Phoenix Park Hotel. The bride came down to the lobby in an elevator and snuck up behind the groom. She then let him know to turn around and see her by grabbing his rear end! It was one of those moments that a Washington, DC, wedding photographer will never forget capturing on film. This fun and lively spirit carried over to the ceremony and then to the reception. Just after the father-daughter and mother-son dances, the bride grabbed the microphone and gathered her closest friends. The newly-married bride then threw on a pair of sunglasses and sat her groom down in a chair. She and her friends proceeding to perform a hilarious song and dance routine for her new husband. He obviously loved every moment, even the part near the end when the bride plopped down on his lap. What we love about this particular image is how happy the groom is as the dance unfolds. Some husbands might have been embarrassed. But it was so clear that a shared sense of humor was what brought these two people together. It had played a key role in their love story and in their marriage celebrations. 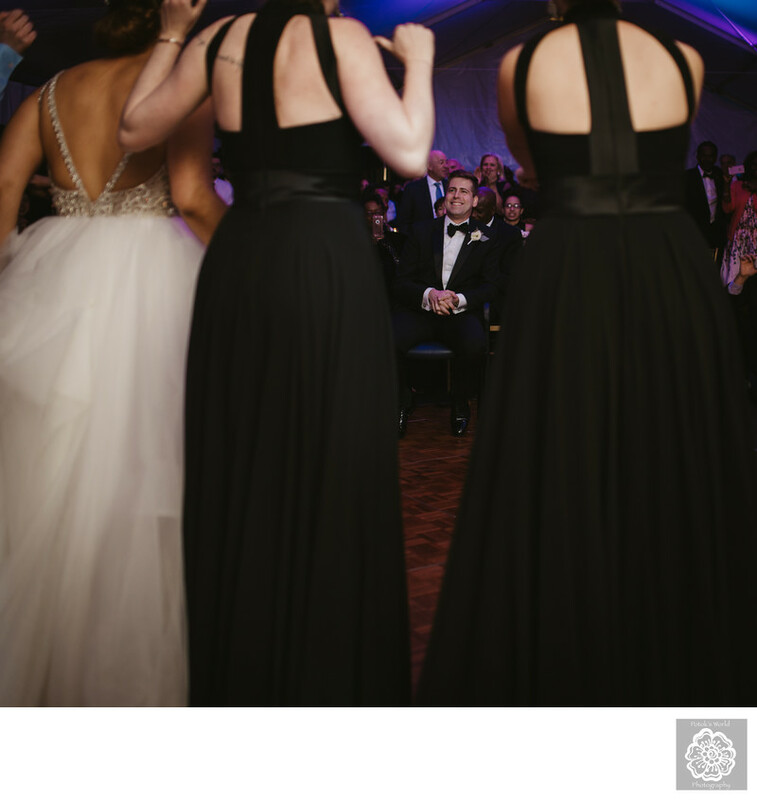 As DC wedding photographers, we were so happy to have given them a memento of a moment that encapsulated that. Location: Charlie Palmer Steak, 101 Constitution Ave NW, Washington, DC 20001.